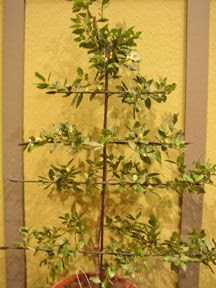 As was discussed in comments on an earlier post, the builders of these temporary display gardens aim to win design and installation contracts--not to give ideas to the average DIY gardener. I do not think that inspiring gardeners and convincing non-gardeners to hire you are mutually exclusive, however. It would stand to reason that good design is attractive to both camps. A green, bronze and white color scheme may not be your thing, but the strength of the foliage arrangement around the urn in the first picture might catch your eye anyway. Those gardens that are especially strong design-wise are often the ones that stay in your mind long after the show has been disassembled. Interesting elements can simply be amusing, too. 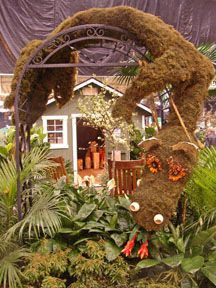 Perhaps you wouldn't want to have this moss monster greet your garden visitors, but his mushroom cap nostrils and orange sunflower eyes probably made you smile and take a closer look. 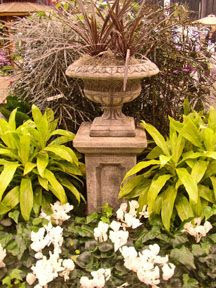 These first two vignettes came not from a landscaper's display garden but from that of a large local garden center chain. Might they feel more comfortable taking risks at shows like this than a landscape designer does? In spite of my enjoyment of certain elements within the displays, my reaction was mostly: "Nice... but Not In My Garden." There was only one garden to which I kept returning. At first glance it looks simple, and feels a little quiet--not my usual style at all. So I studied it, trying to figure out just what it was that I liked so much. Much thought had gone into the placement of sight lines within this display. 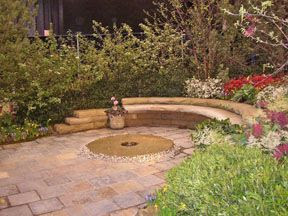 The garden had a main diagonal axis highlighted by metal and stone pathways. The garden structure boasted an open, pergola-style roof and a flagstone floor. The walls were rigid sheets of pierced metal within wooden frames, and all of these panels were attached to the structure with rolling, ba rn-door-style hinges. The structure was nestled within an interpretation of rocky, open woodland. I finally decided that there were actually three things about this garden that intrigued me. The most obvious one was the clever use of metal. Metal generally adds visual weight in gardens, but the spaces in the metal elements that the designer chose mitigate that heaviness here. 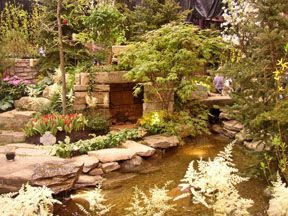 Instead, the metal forms a nice bridge between the dense rocks and the soft plantings of epimediums, moss, hellebores and junipers. 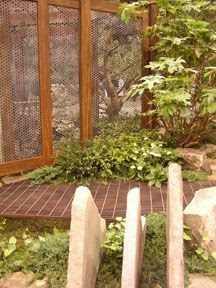 The pierced panels add a sense of mystery to the garden views that they blur. The rusted grate provides a sturdy path to the structure over uneven ground without completely hiding the terrain beneath it. The third element of interest is more of an idea or a statement. At first glance, this looks like a very naturalistic garden with browns, greens, rocks... but consider that the brown of the path is an industrial floor grate, and the most eye-catching rocks have been cut very deliberately and set on edge, evenly spaced in a very deliberate way. Then see that there are plants sprawling over the metal grate and junipers creeping through the stone trio--nature is trying to take the space back. I appreciate this illustration of the tension between the natural and manmade worlds that so many modern gardeners feel instinctively. If you have not yet guessed, the grate is the metal element that I am planning to use in my own garden. I am enamored of it for all of the reasons stated above, and also for two others: 1) As an elevated pathway, it will afford me the rare opportunity to incorporate an "elevation change" in my tiny, flat lot. 2) Planting the area below the grate with thymes and rocks (I don't have the moisture for moss) will definitely create a more interesting walk to the Japanese rock garden. Hopefully it will also slow people down as they look underfoot. Food is one of the main reasons I began to garden. I wanted fresh herbs but didn't want to pay $5 for a wilted bundle of cilantro in the grocery store. 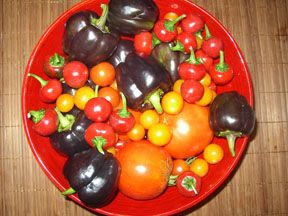 I loved eating real, flavorful fresh veggies and fruit. Not the medium red, perfectly round orbs that fit someone's image of what a tomato should look like but didn't come anywhere close to the way it should taste. In the past few years, I have also been working on living more deliberately. Eschewing things like big-screen TVs and the latest fashion trends, and concentrating instead on buying less stuff and spending more time with people who matter. I have not yet crystallized my thoughts on how food buying fits into my feelings on how to live more responsibly, but I'm guessing that others are probably similarly confused by different issues. (Organic or Local? Frozen or Fresh?) If this topic interests you at all, this short article by Michael Pollen, originally published in the New York Times and reblogged on Kitchen Gardeners International, is definitely worth a few minutes of reading. 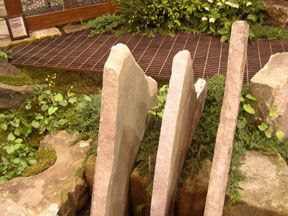 Water and stone seemed to be the common thread that wove together this year's display gardens... along with a distressing amount of reliance on the same color palette. I know that when you think of Ireland, fields of heaths and heathers in swaths of dusty pinks and purples may come to mind. But I simply cannot believe that those colors plus maybe a few white or soft yellow highlights are the only flower colors available in Ireland. There was the odd glimpse of red: red tulips, an azalea that was blooming a little more crimson than cerise, etc. But the only garden that strayed from the general script was a charming little bright yellow cottage planted with an exhuberant mix of red-flowered begonias, dusky purple phormiums, elephant ears, and blue-flowered hydrangeas. Although it wasn't something I would normally like, seeing it was a visual relief! But I digress. There were a number of interesting features within the gardens themselves. 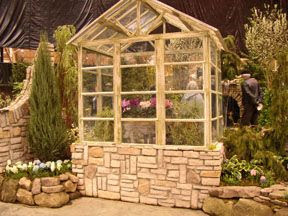 I loved this little pseudo greenhouse. I couldn't help but wonder whether I could incorporate something like this in my backyard, using some of my trashpicked windows. 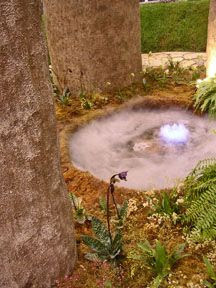 This garden had an interesting little hidden cave by the side of a "stream"... it's hard to see inside, but there was a campfire set up inside. The case of Guiness bottles on the top of the cave was a little bit too much of pseudo-clever joke, though. 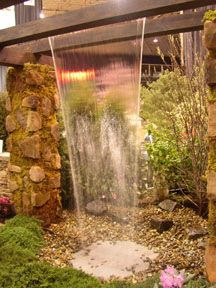 This sheet of falling water came out of a pipe hidden in the last beam of an arbor. The supporting columns were sheathed in rocks and fake moss. 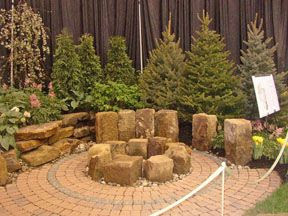 The Cleveland Home & Garden Show is held each year in early February at the IX Center--a huge soulless warehouse of a building. I can never decide whether the display gardens breathe life into its metal frame or whether the natural beauty suffers in the cavernous, badly lit space. Probably a little of both. 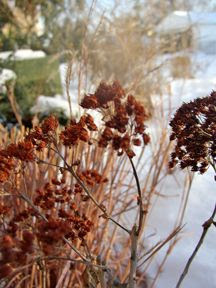 The timing is right, though, for plants and gardens to delight and inspire those who are weary of the whitish greyish brownish monotony of a Northeast Ohio winter. 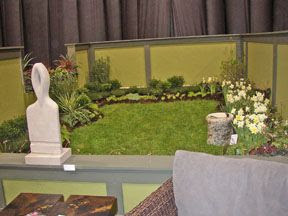 This year, the main theme for the gardens was "Ireland," with a secondary theme of "green." 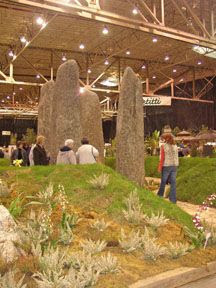 A modern and environmentally friendly interpretation of an Irish castle was the centerpiece of the show. I'm not sure what I expected from the castle, but I wish that more information had been made available on the green building techniques and how they could be adapted by homeowners to improve our own "castles." The interior of the castle was mostly disappointing. The two bright spots were the works from local artists featured throughout the house and the gorgeous kitchen cabinetry. The exterior was beautiful, though, and combined form and function very well. 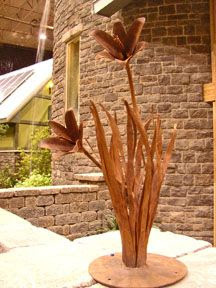 The first picture features a corten steel sculpture of lilies that graced the front patio. (I loved that--I'm a sucker for corten and other rusty metals.) Beyond the sculpture you can see the solar panels on the garage roof and a small waterfall that spills into the "moat" water feature. The second picture shows a green roof that was visible from a second story walkway. The grass courtyard surrounded by square planting beds is pretty, but I couldn't help but think there are more practical planting options than grass when you are building a green roof. I also couldn't see where the excess water from the roof drained, even though it was obviously built on a slant--I suppose that these are some technical details that aren't worth worrying about when you're building a short-term display, though. 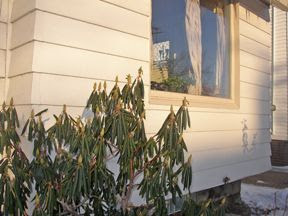 Next to the doorway that led out to the green roof were a pair of espaliered bay laurels that made my jaw drop. I have been checking out my two bay plants every since, wondering why I never thought to prune them into interesting shapes! The castle was the first thing we walked through when we arrived; after that we moved on to the display gardens. Twentysome gardens were created by various landscape professionals and garden centers, most of them "in tribute to" or "sponsored by" (I can't quite figure out how that works) a local media talent. The first display garden that we came to after exiting the castle was not quite like the others--there were no obvious signs with TV station logos and glossy, smiling mug shots at its entrance. It was simply a ring of standing stones surrounded by a waist-high berm of grass. A flat stone walkway encircled the standing stones, and at the center of the stone circle was a misty bog filled with heaths, heathers, orchids, ferns and moss. It was delightfully mysterious, a Druidic ruin brought into the modern day. Most of the rest of the display gardens were not so much in keeping with the "Ireland" theme. Even when they were lovely, they did not quite transport you to anyplace other than an expensively well-done backyard... and I really wanted to be transported. 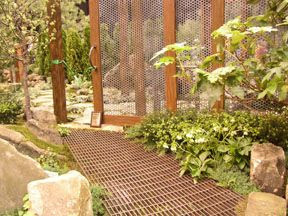 Although I was not very enthusiastic about the display gardens overall, some did have interesting features and ideas. I have a few pictures to show: Some great use of stone, how much interest you can create with just green and brown in a composition, etc. I also found an interesting way to use rusty metal in a practical application in my own garden! All of that must wait for another day, however. I am never good at being concise and I'm sure that I have gone on quite long enough for one post. In the meantime, you should be able to click on any one of these pictures to see it in a larger size, if you want to take a closer look. 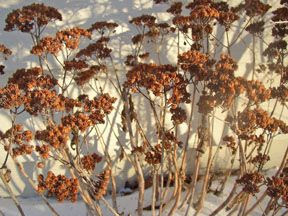 I adore sedum 'Matrona' in the winter. Its deep brownish hue is the one shade of pink that I feel capable of handling in my garden. If only they would emerge this color, they would be a perfect plant for me... but I endure the cotton candy phase, knowing that this quiet beauty awaits me. Just as plants need a break in the winter to rest and regroup, people sometimes need the same. I have been working every weekend, planning my spring garden, cleaning and decluttering my house, worrying about how to pay for repairs should my pipes freeze... and trying to figure out a few of life's great mysteries at the same time. I usually thrive on stress like this, but right now I just feel taut and brittle. I am being rather shortsighted and self-absorbed in comments posted on other blogs, posts shared here, and even in one-on-one conversations with my friends. I am definitely overdue for a little hibernation. It's time to take a step back, send my energy back into my roots, and relax. 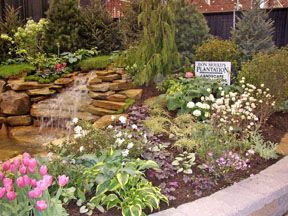 I'll be back in a week or two, and will post pictures and a review of the Cleveland Home & Flower show when I return. I am heading there tomorrow (my birthday--I officially turn 31 at 4:45am) which will be just my second day off since New Year's Day. I am looking forward to getting a few ideas for next year's garden... and some much-needed plant therapy as well. Yup, my lovely orange berries are gone. I noticed their absence as I walked toward the house after parking the car in the garage this afternoon. The funny thing is... I think that I know who ate them! 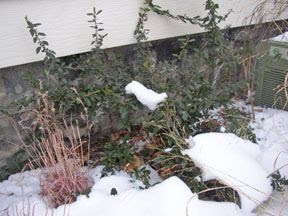 As I left for work this morning, my presence caused a robin to run out into the yard from the vicinity of the pyracantha. I noticed him because it's pretty unusual to see a robin hanging out in Cleveland in early February, especially when the temperatures are in the single digits. I would guess that he's eating well here, though, because he was rather portly, even for a robin. I will be checking some of the other berried shrubs that I see on my daily walks with the dog... it will be interesting to see whether he was just passing through or whether he thoroughly made the rounds in my neighborhood. Okay, I admit it. The title of this post was a geeky attempt at bad botany humor. As I observed my poor cold rhodie do its best impersonation of a needled evergreen, the words Rhododendron Pinifolius popped into my head. I giggled at the thought of making a tongue-in-cheek post to describe the rare pineleaf rhododendron, only observed on special days in the coldest of winters... yes, I'm sure that the cold was getting to me! It amazes me that plants have such great coping mechanisms. It looks unhappy, but what the rhodie is doing is curling its leaves to keep the moisture from leaving through tiny vents in the undersides. It was -1 degree outside when I took all of these pictures yesterday morning. This morning I got up at the same time but was greeted by -4 degrees instead. I couldn't tell if the rhodie leaves were more tightly curled this morning or if I was just expecting them to be, though. I don't really mind the cold itself, even if you factor in the wind chill. The big downside is that the pipes in my upstairs bathroom tend to freeze when it's below 12 degrees unless I leave my sink faucet drip. Friday night I discovered the hard way that when temps drop below 5 degrees, the sink doesn't quite move enough water to prevent the pipe freeze. The pipes thawed on Saturday, but I have since had to leave the bathtub faucet drip as well to ensure the pipes don't freeze again and burst. My February heating bill is going to be bad, and my water bill is not going to be a whole lot of fun, either. I'm so appalled at being forced to waste so much water that I am already saving to tear down a few plaster walls this spring (where certain plumbing pipes reside) and replace them with insulation and drywall. Obviously I will not be going out for a steak dinner any time soon. On the bright side, I've been able to drink in a lot of beauty to help sustain me through the frigid cold. With brittle sunny skies and the lovely crunch of snow underfoot, NE Ohio has never looked more beautiful to me as it does this winter. 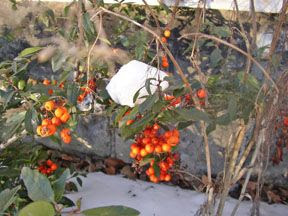 It may just be my imagination but the cold seems to tinge the snow and even the air with a slightly blue hue, which makes orange pyracantha berries, the deep rose of papery sedum flowerheads, and even the slightly pink hue of dried little bluestem blades glow like the jewels of the winter garden.